Last weekend, while Vice-President and former Indiana governor Mike Pence was giving the commencement address at Notre Dame University, over 100 students walked out in protest over his anti-LGBTQ and anti-refugee policy positions. Pence used this opportunity to give a 15-minute lecture about free speech on campuses, condemning what he calls “speech codes, safe spaces, tone policing, administration-sanctioned political correctness—all of which amounts to nothing less than suppression of the freedom of speech.” In contrast, he extolled the virtues of civility, open debate, the pursuit of knowledge, and the free exchange of ideas. Pence’s arguments, which sound lofty and noble, conceal as much as they reveal about the role of free speech in educational contexts today. Much has been written in the past several months about dramatic conflicts at universities, especially those between protesters and high-profile far right figures like Ann Coulter, Milo Yiannopoulos, and Richard Spencer, bringing the issue of student activism and free speech to the forefront. While the recent focus has been on these so-called “alt right” celebrities and the growing role of groups like the Young America’s Foundation (YAF), there is a much longer history of conservative speakers being invited to campuses under the banner of free speech. Here I examine the groundwork laid by the Federalist Society, a long-standing legal organization which has been sending reactionary speakers to universities for nearly 40 years. Drawing connections between arguments used by liberal proponents of free speech and the rhetoric of the alt right, I examine how the free speech and open debate arguments being used today to defend the hateful messages of far right speakers have been established over a long period and need to be explored in the context of rising fascism, white supremacy, and extreme social inequality. From this perspective, the comments of Pence (himself an affiliate of the Federalists) take on a deeper and more ominous meaning. Outside the legal profession, most people know very little about the Federalist Society, a group that has been called “quite simply the best-organized, best-funded, and most effective legal network operating in the country.” As the political right gains traction under the Trump administration, it is worth exploring the mission and history of this group, which has played a critical role in the conservative shift of law and politics over the past 35 years. One of the ways the Society has spread its ideas and found new members is through its long-standing debate program, in which far right attorneys are sent to speak at law schools. According to their latest annual report, the Federalists spent $2.5M on student debates and hosted 1,100 events at law schools across the country in 2016 alone. The Federalist Society was founded in 1980 by law students and faculty who felt alienated by the allegedly liberal atmosphere of law schools. Since then, the organization has been enormously successful in translating its ideas into law and policy, and has done so while remaining mostly outside the attention of media and the general public. In their recent book, The Federalist Society: How Conservatives Took the Law Back From Liberals, Michael Avery and Danielle McLaughlin show how unrestricted funding provided by billionaires like the Koch brothers and John Olin has allowed the Federalists to promote extremely conservative legal positions which privilege private property rights, criticize government interventions in social and economic problems, and target the rights of women, immigrants, people of color, and gay and trans individuals and communities. Since its founding, the Society has grown exponentially. From four law school chapters in 1982, it has expanded to over 60,000 members in its 300+ student, lawyer, faculty, and alumni divisions. However, not all “members” pay dues and the organization’s claims that they have active chapters at every law school are exaggerated. Regardless of actual numbers, the ideas of the Federalists have spread rapidly through members’ prolific publications, presentations, and influential public positions. With an annual budget ranging from $10-15M, the Federalists have developed a powerful network of think tanks, law firms, faculty, judges, and politicians. The Federalist Society has been extremely successful in getting its members into powerful positions while keeping its influence out of public view. Those unfamiliar with the Society may be surprised to learn that its members are represented at every level of government and the judiciary, including four current Supreme Court justices (Clarence Thomas, John Roberts, Samuel Alito, and most recently, Neil Gorsuch). Every Federal Judge appointed by Presidents Bush (Jr. and Sr.) was a member of the Society or an approved affiliate of the organization, and every Republican administration since Reagan has included prominent Society members. This trend continues and has become even more pronounced with the Trump administration. During his election campaign, Trump promised that all of his judicial nominees would be “picked by the Federalist Society” and since becoming President he has consulted with both the Federalists and conservative think tank The Heritage Foundation in making lists to fill the 120+ currently vacant federal court positions. Federalist Society members argue that they do not have a specific “agenda” and that there is nothing clandestine or nefarious about their organization. Indeed, the Society is very public about its mission, its focus on ideas, and its commitment to speaking openly about conservative legal perspectives. Furthermore, given its alliance of libertarians, economic conservatives, social conservatives, and Christians, it is true that the Federalists cannot be said to be an ideological monolith. In fact, the organization itself does not lobby or take public policy positions, but rather relies on its individual members and allied organizations to pursue goals such as rolling back affirmative action and identity-based discrimination laws, contesting government regulation of the economy and environment, removing access to legal remedies for workers and consumers, expanding state support for religious institutions, opposing abortion, protecting private property, challenging protections for immigrants, and limiting the size of the federal government. The overall impact of these various (sometimes disparate) positions is to provide advantages to the already wealthy, while leaving the rest of society poorer and increasingly disenfranchised. Although the Society presents itself as simply an intellectual forum, in reality it holds an immense amount of power and influence. For decades, the Federalist Society has sponsored debates at law school campuses in which their members argue the various positions described above. Organizing debates is a key strategy of the Society, which allows it to present itself as offering a dialogue of perspectives in order to provide a platform for what is often dehumanizing and far right rhetoric. In recent years, the Federalists have organized events featuring right luminaries such as John Yoo (author of the “torture memos”), Ryan Anderson (Fellow at the Heritage Foundation who calls gay rights “make believe” and defends conversion therapy), Roger Clegg (President of the Center for Equal Opportunity who argues that affirmative action discriminates against whites), Ilya Shapiro (Fellow at the CATO Institute who claims that corporate donations to political campaigns are not a problem), and Edward Whelan (President of the Ethics and Public Policy Center and proponent of the controversial “Bathroom Bill” in North Carolina, who argues that transgender activism has produced legal absurdities). Competing perspectives on free speech across the spectrum of the left are worth examining at this fraught political moment. One popular approach, exemplified by our allies at the ACLU, argues that even hateful speech is constitutionally protected. From this perspective, speech that attacks individuals and groups based on race, gender, ethnicity, religion, or sexual orientation is both legal and defendable. The ACLU and many liberal-minded people assume that allowing all speech under any circumstances will ensure that the best ideas win out and that it is ideal to have even potentially dangerous ideas out in the open where they can be challenged. They question attempts by universities to adopt codes and policies prohibiting hate speech, arguing that this well-intentioned response is incorrect and akin to censorship. Rather than restrict the right to use racist, sexist, transphobic, ableist, or other such speech on campuses, the ACLU recommends an educational approach that offers less intolerant viewpoints from which individuals can choose. A final important argument from this perspective points out that the limiting of speech on one end of the political spectrum can produce limitations on any speech found to be controversial, and will inevitably lead to greater restrictions on the other end. This approach may seem logical and commonsense to many, and this line has certainly been taken up by the far right, who complain that the failure to include conservative views alongside liberal perspectives is a violation of free speech. On university campuses, reactionary student groups and their supporters draw on First Amendment arguments to promote agendas that are openly racist, sexist, homophobic, transphobic, xenophobic, and ableist. They claim that any resistance from the administration or the student body to these hateful ideologies is in violation of legally protected speech, and even ostensibly progressive universities have given in to this pressure by monitoring and censoring opposition. Extreme right fascist and white nationalist groups outside of universities also rely on the discourse of free speech to claim their views are valid and protected. While complaining about the “politically correct snowflakes” on the left, these far right speakers and their supporters actively cultivate their status as victims by attacking the vulnerable through their hateful speech and then claiming persecution when challenged. From the commonsense liberal approach described above, the best way to address these kinds of speakers would be to let them express their views so others can decide if they agree or not. If all sides are debated openly, advocates of this perspective contend, the best one will obviously succeed. However, far right conservative and fascist ideology is not simply based on logical and reasonable arguments; rather, these movements depend on the irrational mobilization of hate, fear, and anger against some of the most marginalized and vulnerable populations. Offering them an open forum and vigorously defending their right to promote harmful speech confers legitimacy on their positions as being equally as acceptable as any other. Another problem with the liberal free speech model is that is does not take into account the asymmetry of different positions and the reality of unequal power relations. Arguments about free speech rarely address the significant imbalances in power that exist between, for example, a wealthy white speaker with the backing of a multi-million dollar organization and members of the populations affected by their words (i.e. immigrants, people of color, queer and trans people, low-wage workers, etc.). What are lost in the abstract notion of free speech are the rights of those who do not have the connections or wealth to equally participate in public discourse. The “marketplace of ideas” is like any other marketplace; those with the most resources dominate. Finally, the trend of students and local community members protesting reactionary speakers at universities has led to outcry about the “intolerant left” violating the free speech of the far right. But those who are so determined to protect the free speech of fascists, white supremacists, and other hate groups should be equally as concerned with protecting the right of dissidents to protest these viewpoints. While giving a speech attacking individuals and groups based on their race, sexuality, or immigration status is considered legal and acceptable by universities, the protests of those who find these viewpoints reprehensible are often censured or punished by the same institutions. It should give us pause that recent model legislation to protect “free speech” on campuses and to discipline those who protest controversial speakers comes from conservative think tanks The Heritage Foundation, The Goldwater Institute, and The Ethics and Public Policy Center. Since the 1980s, when the Federalist Society began sending extremely conservative speakers to law schools, concerned law students and faculty have responded in various ways. In 2001, the American Constitution Society was formed to help counter-balance the effect of the Federalists in law schools. The ACS position aligns with the general liberal perspective described above and held by the ACLU. By taking part in the Society’s debates, and regularly co-sponsoring them, they hope to provide other, less harmful perspectives. NLG faculty members have also taken part in these exchanges, although Guild members are generally more cautious about participating in debates that are framed in biased or oppressive ways. While there are advantages to debating conservative speakers head on, this approach also comes with the danger of legitimizing or validating the terms of the debate. However, taking part and challenging the framing of the debate itself can be a politically useful strategy under some circumstances. Finally, it is important to acknowledge the reality that Federalist Society speakers have access to resources that make it far easier for them to have a platform than many ACS or NLG speakers. While the Federalists can afford to pay for travel, expenses, and honorariums for their spokespeople, many progressive speakers have to turn down speaking engagements for lack of funds. Federalist Society speakers have often been met with protests from law student groups like the NLG, OutLaws, and If/When/How. Challenges to reactionary speakers have included putting up flyers with information about the speakers and their background, circulating petitions to have the event cancelled, organizing counter-events and speakers, writing op-ed pieces for campus and local publications, sending students to the event with a list of critical questions, and protesting outside or within the event by walking out or holding signs. 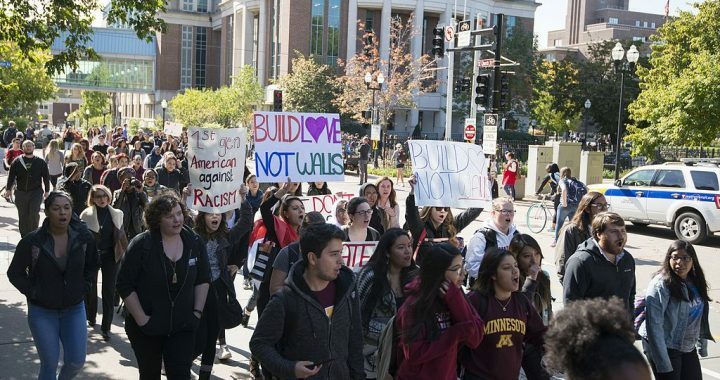 University administration responses to these kinds of interventions have often been to stifle the protest, although these activities also fall under the banner of protected speech. Law students report having their fliers removed from the campus, being threatened with disciplinary sanctions, or even being told that protesting will lead to negative evaluations on the Character and Fitness Exam required for the bar. While the rights of dissenting students are suppressed, the ability of far right speakers to disseminate hateful rhetoric is protected through claims of the right to free speech. These are only some strategies for confronting harmful speech in educational settings. While liberal advocates are quick to invoke First Amendment arguments to allow all speech, there are other considerations to take into account as well, such as: Who is able and allowed to speak, under what conditions and with what consequences? What voices are silenced and what forms of dissent are possible (or not)? Universities can use free speech principles to justify invitations to xenophobic and hate-mongering speakers, but not inviting or funding these people is not necessarily a violation of their free speech, especially when they have many other platforms for getting their message out. Private schools, for example, are not bound by the First Amendment in the same ways as public schools, and can therefore make policies about hate speech that limit invitations and/or funding to reactionary speakers and groups. When the views of speakers are actually dangerous to other people, universities should consider the implications and balance the need for a diversity of viewpoints with the consequences of invalidating the humanity or rights of entire groups of already disadvantaged people. Jerry M. Landay, “The Conservative Cabal That’s Transforming American Law,” Washington Monthly, March 2000. For more information, see the Federalist Society website. Background information can be found at fed-soc.org/aboutus/page/our-background. Michael Avery and Danielle McLaughlin, The Federalist Society: How Conservatives Took the Law Back From Liberals (Vanderbilt University Press, 2016). Ralph G. Neas, “The Federalist Society from Obscurity to Power: The Right Wing Lawyers Who Are Shaping the Bush Administration’s Decisions on Legal Policies and Judicial Nominations,” Report of the People for the American Way Foundation, 2001. Available at: http://files.pfaw.org/uploads/2017/01/federalist-society-report.pdf.